Choosing the right glass for serving whisky is absolutely essential to maximise enjoyment. Depending on how you’re intending to consume your whisky, there are various glasses, which each have their own characteristics. Whilst some glasses are best for a whisky on the rocks or a few fingers of your favourite casual tipples, others are specifically designed to pick out the complex aromatic nuances. 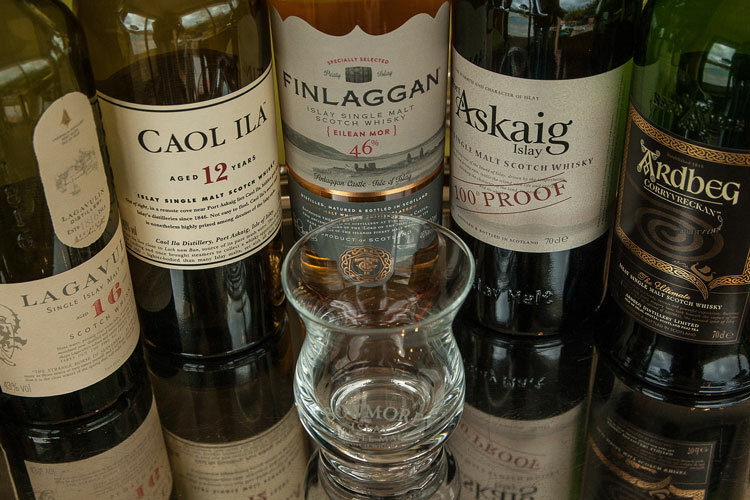 In this guide, you will discover the best whisky glassware that every collector should own. Furthermore, we’ll also cover a few other important accessories to keep in mind if you want to seriously enjoy your whisky. Use the links above to jump ahead and read up on each of the glasses’ profiles. Before we even begin to discuss what goes into a glass we must make sure that you know what a proper whisky glass looks like! Just as a Champagne connoisseur would balk at being served a millésime blanc de noirs in a flute glass, so too should the single-malt collector drink ONLY from the appropriate glass. Why, you ask? Because the glass determines how you pick up the flavor nuances, receive the correct amount of scent, and have the perfect amount cross your lips. Therefore, it’s essential that you pick the right glass according to both your needs and intentions. I found my glasses here. Just what I wanted for an evening with the lads. Whisky Glassware Guide Reviewed by Arthur C. on April 30th . This is the classic glass which you will see depicted in television and movies. Gentlemen retire to the study, the glasses come out, ice is thrown in, and the gang slowly sips among the dusty books and well-worn leather furniture. Whatever your stance on the whisky and ice controversy, the notion above is both a romantic and accurate view of how to enjoy a single-malt. Therefore, the tumbler is the standard glass which will allow you to pour the correct amount, receive a decent nose full of scent, and an easy sip. Being round, stout, hearty, and ready to be by your side on any occasion, tumblers are a versatile choice of glassware. Not only should your bar be stocked with these for your Scotch drinking but they are a versatile tool for any beverage lining your walls from a classic Sazerac, to a stoic gimlet, or simply a nip of brandy. Old Fashioned glasses range in price but our favorites are the inexpensive versions. This eliminates worry should your company fail to maintain a tight grasp on their cocktail. You can expect to pay between $5 to over $100 per glass depending on quality and the type of glass used. Deriving its name from the Glencairn Crystal Company, this is a more sophisticated piece of glassware characterized by its fluted shape, small stature, and delicately thin body. A Glencairn is the glass of choice for the serious collector who wishes to pull every nuance out of his bottle. It was designed to greatly amplify the aroma, not just when sniffing, but when sipping. Much like the best Champagne glasses, it’s designed with a tulip shape that helps gather the aromatic compounds within the glass and form a bouquet. Overall, it improves the tasting experience by waking all the senses. As we all know from anatomy class, the way to your taste buds is through your nose, so a strong cloud of single-malt scent pushes your taste buds into overdrive. While these will do equally well for any bottle at any price point, there are two must-use occasions: the first taste from a new bottle and any pour of Scotch approaching or exceeding the $100 price point. The former, so you can experience everything this new bottle has to offer. The latter, so you do not miss any of the intricacies which a high-end bottle contains. Obviously feel free to use these with any pour but beware that an inexpensive bottle may drink with a bit more burn, both in your nose and mouth, due to the concentration/amplification of the fusel alcohols present. Also referred to as ‘ginger jar’ lids, these are another noteworthy item. Glencairn glasses can be obtained with lids that cover the opening. This is not just for storage, though certainly handy for keeping glasses clean. It is meant to assist in correctly agitating your Scotch. Learn more about whisky agitation in our guide to the art of the pour. Note that a true Glencairn glass is made of pure crystal. We strongly recommend obtaining a pair of these as you begin your journey. The feel and the weight of a true Glencairn adds to the entire experience and truly complete your ritual. A pair of Glencairn glasses runs approximately $20 USD; well worth the investment. There are “glencairn” glasses available which are made out of glass. They are slightly less expensive and easier to find; making them great for having in reserve when friends join you for a dram. The copita, also known as a dock glass or “snifter”, is the glass you will see the master distiller using to taste the distillate as it is transforming into a finely aged whisky. Similar to a Glencairn, it is fluted but has a stem and foot– allowing you to hold the glass without applying your body heat to the liquid. These look professional, stylish, and are generally more formal than either a Glencairn or Old Fashioned. However, at double the cost of the Glencairn and with very indistinguishable differences, only the most serious of collectors keep these on hand. The copita glass is best used with your best bottles. Though anytime you want to spend a bit of time dissecting a scotch this would be appropriate. Copita glasses begin around the $12 price point for a basic glass vessel. You may also consider adding a lid, particularly for higher-end and decorative pieces. While not a necessity in your bar, owning a quaich is both the hallmark of a true enthusiast and a way to take your scotch ritual back to its roots. Drinking from a quaich is best done for a celebratory or ritual need. A wedding, graduation, marriage; any situation where the experience trumps the contents of the quaich. The quaich will cost you in a range of $50 to thousands depending on size, material, and craftsmanship. It is no secret that we love Davidoff cigars here and, pleased to say, have found their whisky glass to be just as enjoyable. You can read our full review here: Davidoff Winston Churchill Whisky Glasses. This is the most obvious of all uses–with a cigar. One of my favorite uses is to set a table for dinner and place a stick and a few fingers of scotch in each glass so my guests can immediately begin enjoying themselves. Of course, these could easily replace the standard Old Fashioned glass in your rotation–particularly if you often pair a cigar with your scotch ritual. As we previously covered, these are one of our favorite glasses at Bespoke Unit. When it comes to your favorite things cost is no object. Though it can still be quantified. At $95 per pair, these are not a small expense. However, they are quite worth the investment. Furthermore, they’re often sold out on the site and you’ll need to visit a Davidoff store to be sure to pick up a pair. However, Corkicle have released a similar tumbler, which you can pick up for a measly $25 on Amazon if you want to try it out. While not technically a drinking vessel, a water pitcher allows you to keep a small amount of room temperature water on hand. As explored in our guide on water and ice in whisky, water can be used to cut an expression’s flavor, particularly when experimenting with new styles. By the same measure, bringing down the ABV in some cask strength whiskies can help some folks maximize their enjoyment. Meanwhile, a dropper can allow you to methodically add water to your dram so you don’t overdo it. Therefore, if you want to add an element of precision to your whisky-tasting experiences, it’s a must-have that we swear by. Whether glass or fine crystal, the Glencairn pitcher varies in price. Our experience has been that you can find a fantastic 8oz pitcher in the $20-$30 range. Regarding droppers, unleaded ones can be found pretty readily in the $5 range. They tend to last forever so long as they remain on the shelf and not under foot. How I Care For My Whisky Glass? Caring for your scotchware is very straightforward and much like any other glasses in your bar. After use, each glass should be hand washed with very hot water, patted dry with a terrycloth, and left to air dry. Detergent can be used if there is, say, lipstick, upon the glass. However, detergents will cling to a glass and affect the viscosity of your dram. When using detergent I prefer to give it a second rinse after the glass has dried. A quaich will require a bit more tending to maintain. For silver quaichs a quick touch of polish is likely in order. For wooden quaichs, they may require an oiling but do this sparingly as the lipids in the oil can affect your next dram. So, be sure that you use oil sparingly and that the quaich has dried for at least a day after being applied. Horn quaichs you will need to be thoroughly dried before storage. How Should I Store My Whisky Glasses? Storage can be in any location, including on an open shelf, dry bar, cupboard etc. It is preferable to store the glass upside down to prevent dust or debris from entering. Storing right-side up works but cover the glass opening if you let your glasses sit for more than a week between washing. Something as simple as a playing card, coaster, or dish will work. I have seen custom cut wooden slats used as well. (These have the added benefit of allowing glasses to be stacked!) Obviously, the Glencairn lid will handle the job flawlessly. With the right glass you can change the experience of your tipple from serious tasting research to a casual chat with the chaps. We hope this guide has inspired you to experiment and expand your glass collection. I’ve temporarily been using cognac glasses for tasting whisky as I haven’t got the space for proper ones. Is this acceptable? Cognac glasses should be ok in the short run as they still provide a decent bouquet. However, the length of Glencairn glasses helps you discover nuances of aroma as more alcohol will have evaporated.